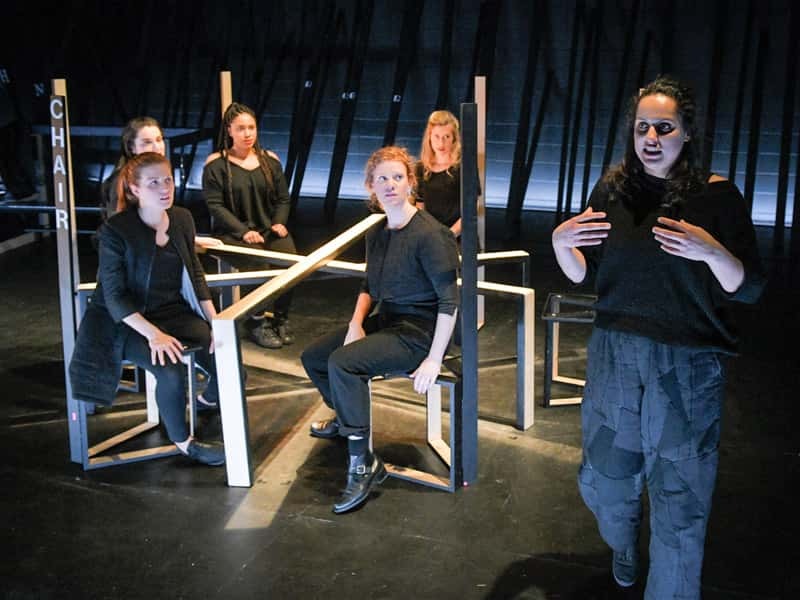 Talisman Theatre champions the same mission written by its founders in 2005: "To produce professional premieres of contemporary Quebec plays in translation for the English stage". Lyne Paquette, Artistic and Executive Director. For the latest Clean Slate reviews, click here. Hi! 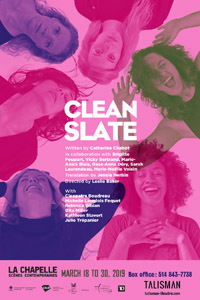 I am proud to announce Talisman’s next production will be Clean Slate by Catherine Chabot in collaboration with Brigitte Poupart, Vicky Bertrand, Marie-Anick Blais, Rose-Anne Déry, Sarah Laurendeau and Marie-Noëlle Voisin, translated by Jennie Herbin, directed by Leslie Baker. L-R: Catherine Chabot, Playwright; Jennie Herbin, Translator; Maureen Labonté, Translation dramaturg; Leslie Baker, Director. Six friends gather at a site of their shared childhood: They drink, they laugh, but most importantly, they admit things they’ve never before had the courage to say. 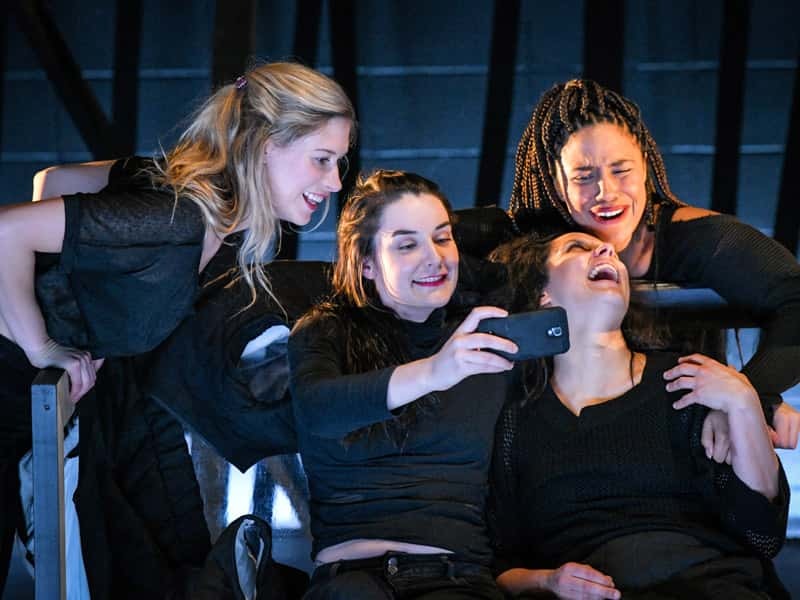 Inspired by the seemingly incomprehensible decision of their friend, the girls make a pact to shed their traumas and bad habits and start afresh. 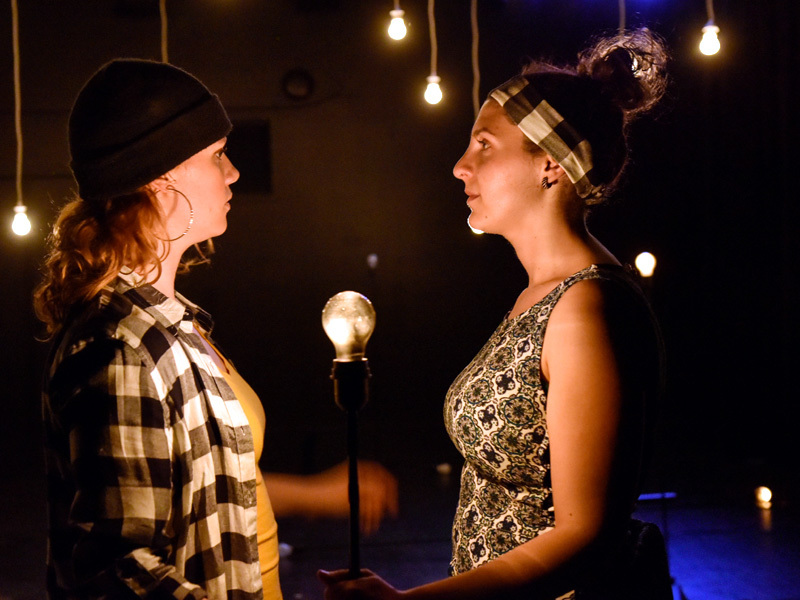 With the honesty and intimacy of a death bed, Clean Slate allows the audience to eavesdrop on a brave, messy, and above all authentic portrait of millennial sisterhood. 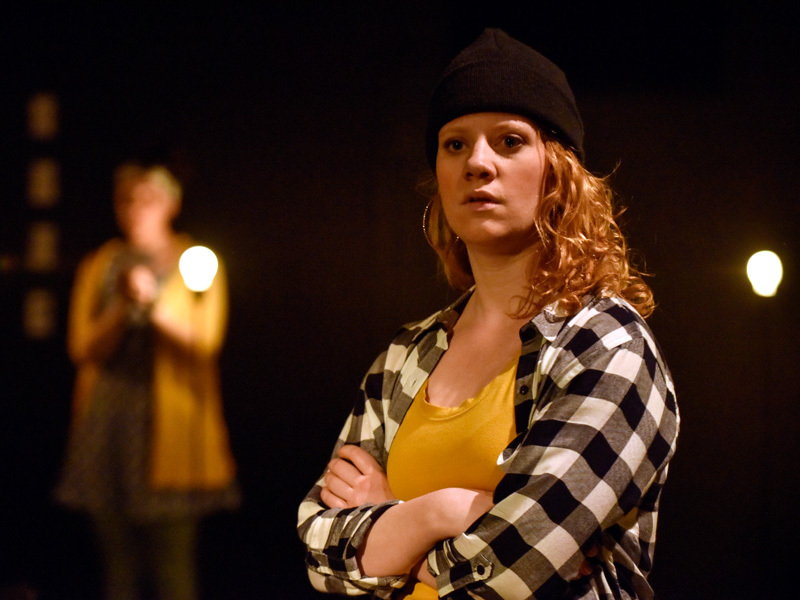 This translation is commissioned and developed by Playwrights' Workshop Montreal's Cole Foundation Emerging Translator program. Clean Slate is almost here! 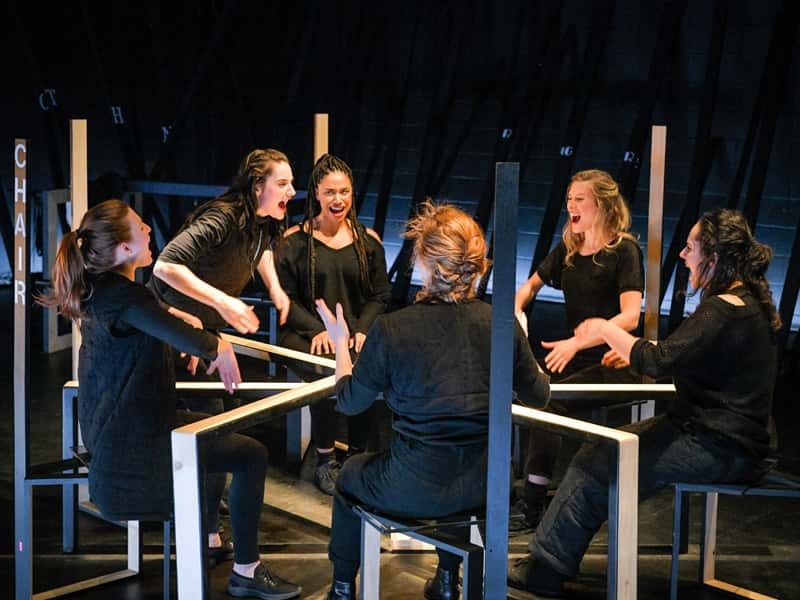 Our team has been working hard all month under the guidance of director Leslie Baker rehearsing Clean Slate the English-language premier of the Quebec sensation Table Rase. Prepare to be astounded! 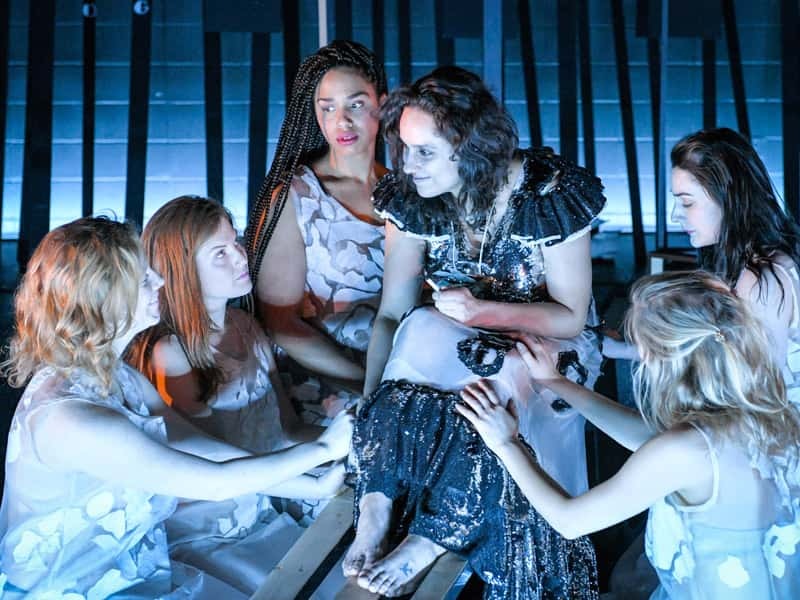 Featuring a set made by the highly-conceptual Italian designer Peter Bottazzi, lighting by Cedric Delorme Bouchard, costumes by rising-star Sophie El assaad and sound design by Peter Cerone, this will be a wild-ride that shakes-up preconceived notions of female friendship, vulnerability, and theatrical realism. 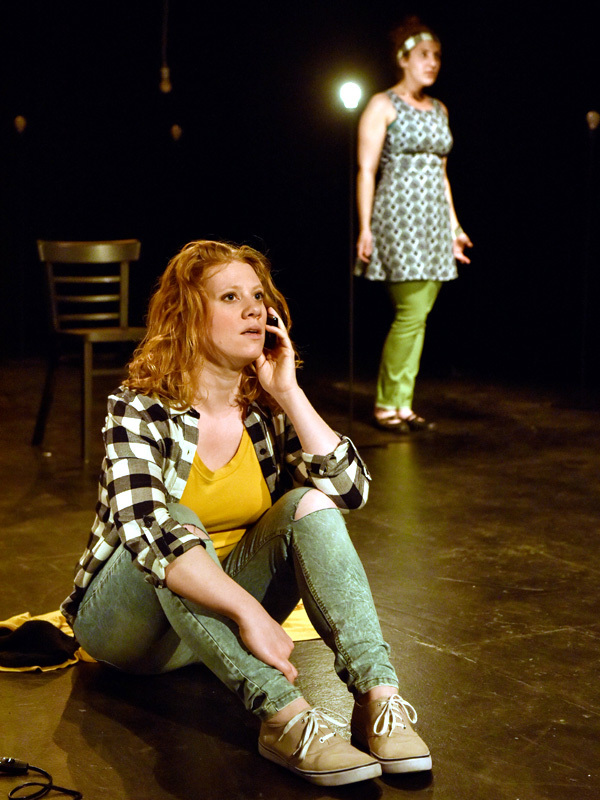 Clean Slate runs from March 18-30 at LaChapelle Theatre. Tickets are selling fast, to get yours, click here. We held our annual fundraising cocktail in the gorgeous atrium of the Conseil des arts de Montréal. It was a brilliant success and a good time was had by all! We raised almost $8,000 for our upcoming production thanks to the generous support of everyone who bought tickets, and who bid in our silent and live auctions. 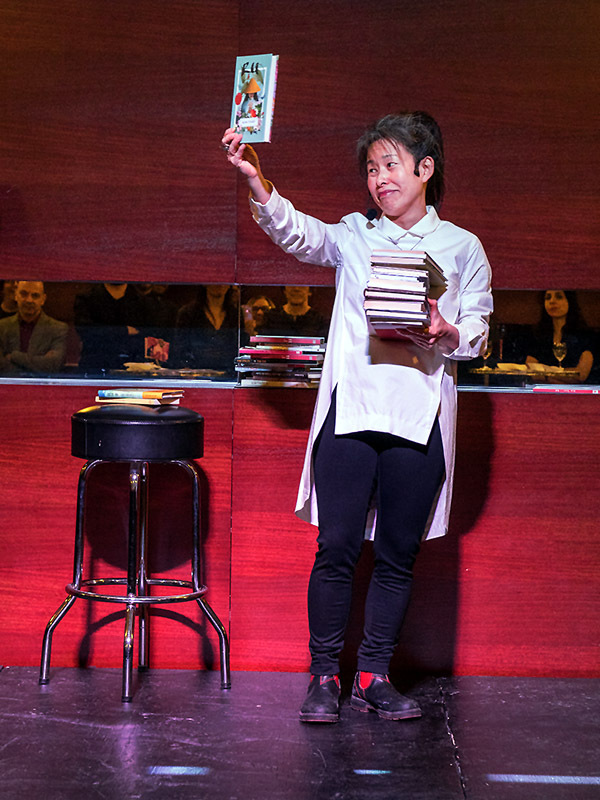 Our guest of honour, Kim Thúy, was fabulously funny and charmed the crowd with tales of translation and travel. We are especially grateful to our hard-working Board of Directors and the volunteers who made this event the triumph that it was, especially the President of our Board, Christine Lord, who went above and beyond to support us in our fundraising efforts. To see the photos, click here. 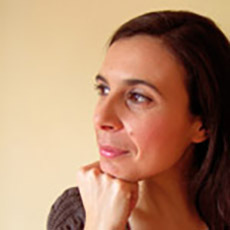 Talisman welcomes Inés Adán to our team! 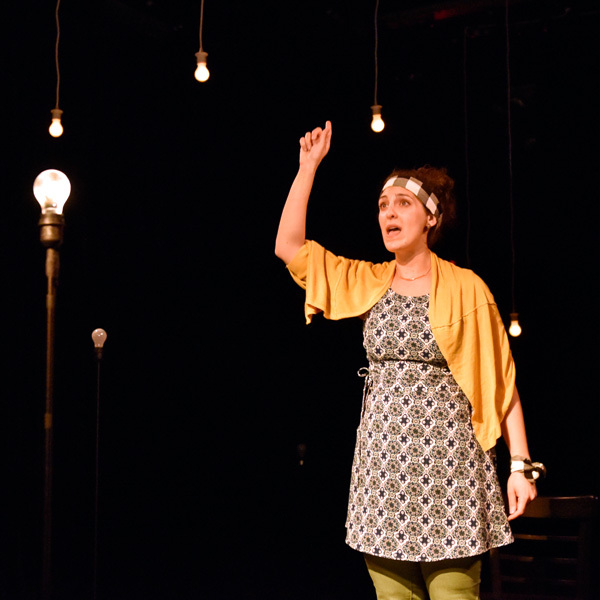 Inés is a theatre director, and cofounder of the theatre company Mundanal Ruido Teatro. 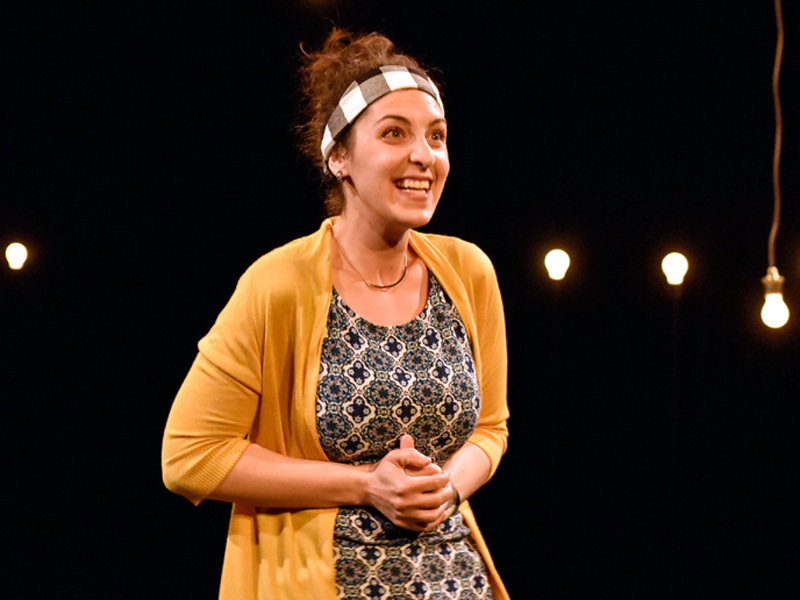 Inés is interested in theatre as an educative tool for social change and her works often mix performing languages, such as puppetry or music, with theatre. For the next six months Inés will be working with Talisman through the DemART program of the Conseil des arts de Montréal, a program which facilitates the integration of culturally diverse artists and cultural workers into the Montréal arts sector. 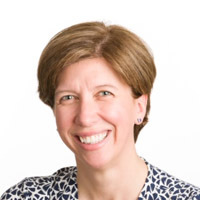 We are happy to welcome Catherine Doyle to our Board of Directors. Catherine holds a Bachelor of Journalism, with Combined Honours in Political Science, as well as a Bachelor of Arts, from Carleton University. She has experience in corporate communications, media relations, internal communications and government relations. Midnight team returns from Louisiana! This month, Artistic Director Lyne Paquette, along with author Marie-Hélène Larose-Truchon, translator Alexis Diamond, and director Emma Tibaldo, had the amazing opportunity to visit New Orleans, Louisiana, to workshop and present Talisman’s translation of Midnight at the Southern Rep Theatre as part of a cultural exchange initiative. To close the trip a public reading of Midnight was presented by some talented local actors. Talisman is immensely grateful to Aimée Hayes and the amazing team at Southern Rep for the invitation and the warm welcome. Talisman has commissioned more translations, and this fall we will share these projects with you! 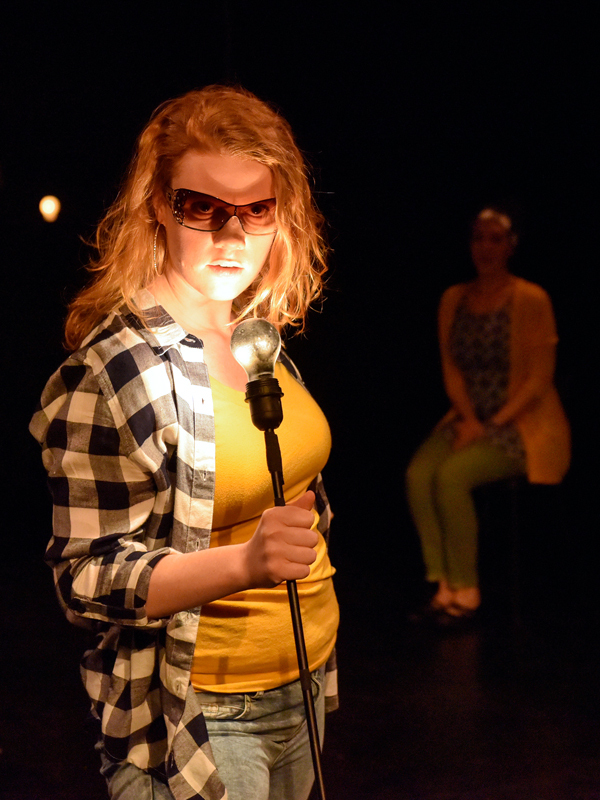 We will host two more Public Readings in November in collaboration with Playwrights' Workshop Montreal. Midnight, Alexis Diamond's translation of Marie-Hélène Larose-Truchon's Minuit will be read on November 14, and Wildfire, Leanna Brodie's translation of David Paquet's Le Brasier will be read on November 23. For more information check out the events for Midnight and Wildfire. All public readings are free and open to all, but make sure to reserve your seat through one of these links : Wildfire, Midnight. We are happy to welcome Gérald Gauthier to our Board of Directors.Holder of a law degree and a Master of Business Administration, Gérald Gauthier has extensive experience in public and corporate affairs, including regulatory affairs, mainly in the rail transportation sector. He worked in a private law firm specialized in civil and commercial law, before joining Canadian Pacific Railway, and later, the Railway Association of Canada, where he held several executive positions, including the presidency. I'm happy to announce that we have two new plays in translation Midnight (Minuit) by Marie-Hélène Larose Truchon translated by Alexis Diamond with translation Dramaturg Linda Gaboriau and Wildfire (Le brasier) by David Paquet translated by Leanna Brodie. In Midnight, Quebecois issues surrounding reasonable accommodation are given allegorical meaning and life against a dystopian backdrop. It is a love song to an endangered civilization. 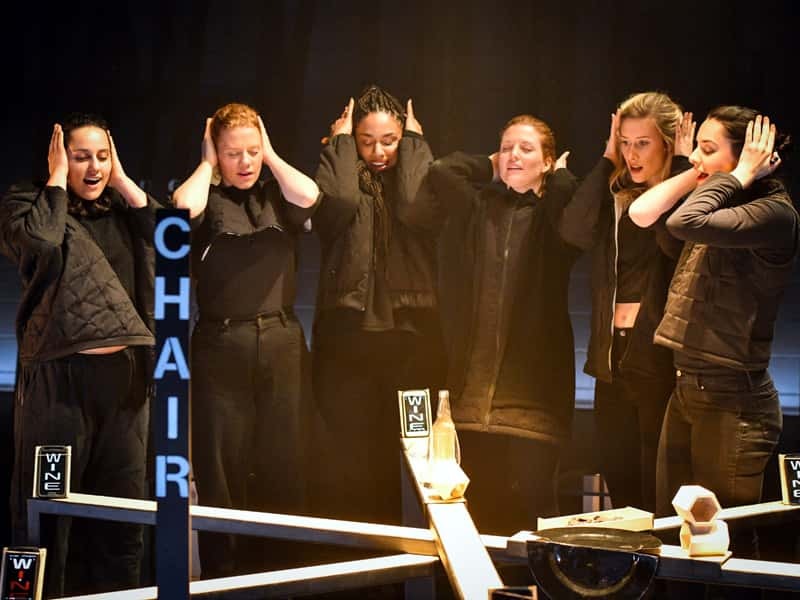 Wildfire is a comedy as fiercely dark as any Greek tragedy, a multi-generational drama, a triptych that follows different characters, all subject to the weight of a haunting family history. Thanks to CAM en tournée and the Cole Foundation, Talisman Theatre toured four (4) burroughs of the Island of Montreal. 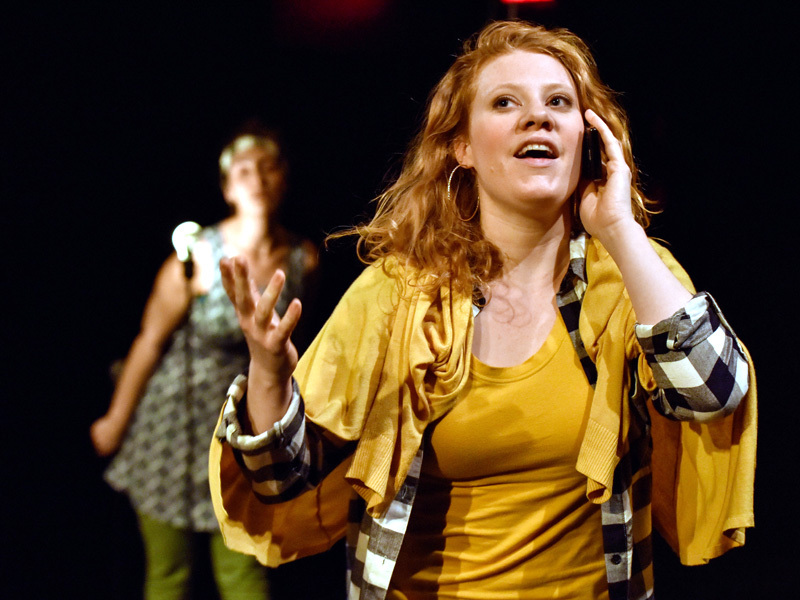 We shared this tale of intercultural integration with 400 new audience members including 113 students, and played to a full house at the new NDG maison de la culture (Salle Iro Valaskakis-Tembeck) on Monkland. To see production details, select/swipe and click/tap on the image. 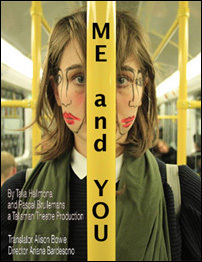 Me and You is written by Pascal Brullemans and Talia Hallmona who were awarded the Louise-LaHaye prize for Moi et l’Autre. 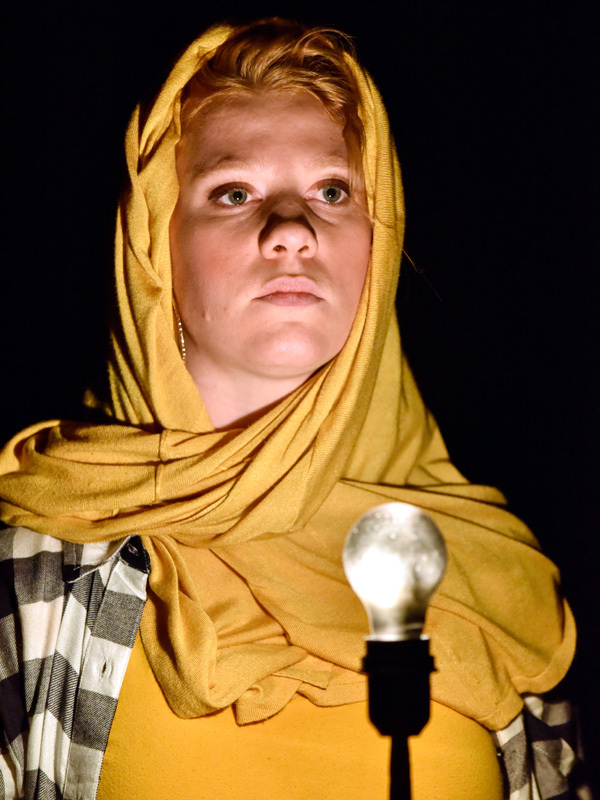 This award recognizes the excellence of a play for young audiences. To download the technical requirements, click here. For more information or a copy of the full-length DVD, please contact Elise Legrand at Scène Ouverte Agency: Elise Legrand Diffusion. 20 April at Tembeck Theatre (Notre-Dame-de-Grâce). Thanks to CAM en tournée and the Cole Foundation. 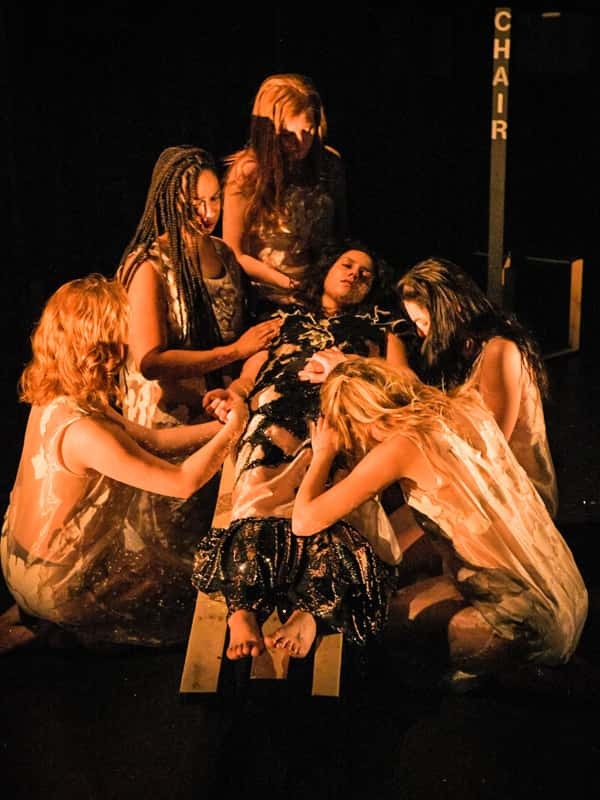 I'm the Artistic Director of Talisman Theatre and I'm asking you to support us by making a donation because I believe in Talisman's unique mission to produce English-language premieres of contemporary Quebec plays, and because I believe you feel the same. 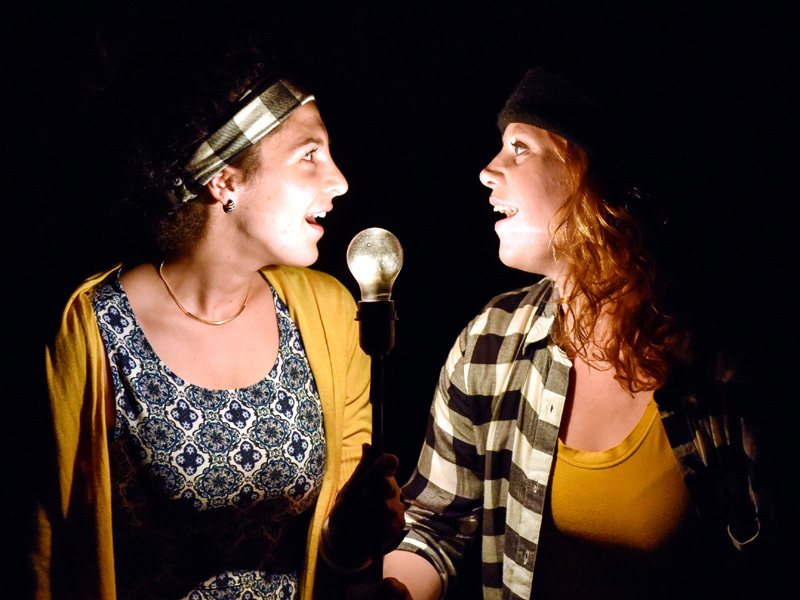 Talisman Theatre builds bridges between Montreal's cultural minorities and the greater population by bringing them the full experience of living in or entering Quebec culture. Please help us to continue building bridges by visiting the links above and making your donation. Use PayPal and be added to our list of Friends, OR make an anonymous donation through CanadaHelps. With either choice, as a donor you will receive a charitable donation tax receipt to reduce your tax burden! As a registered Canadian charity (#801959826RR0001), Talisman Theater is exempt from the Anti-Spam Act. However, in the spirit of the law, if you believe that you have not given your consent to receive our communications, or if you feel that our communications were sent to you in error, or if you no longer wish to receive communications from us, you can opt out from all future communications from Talisman Theatre by entering your email below and clicking on 'Unsubscribe me'.